There is ONE thing we ARE NOT discussing enough when paying off debt. This episode has been on my heart for a few weeks so here I am. The reason I’m doing it is because I’ve seen headlines repeat themselves over and over again. We see headlines of Susie paying off $40k in 10 months or Joe paying off 100k in 24 months. The truth is I have mixed feelings about these stories so I am going to give you some insight on why. This is all my opinion, my thoughts, what is in my heart. In my opinion these headlines, these stories can set the standard of what success is in terms of paying off debt. Paying off debt, no matter how much nor how long it takes is a success. So what about those stories? Brand new FB community just for you! I want to hear from you! How about you? What do you think of these headlines and these stories? Do they inspire you? Do they alienate you? Or do you have mixed feelings like I have? 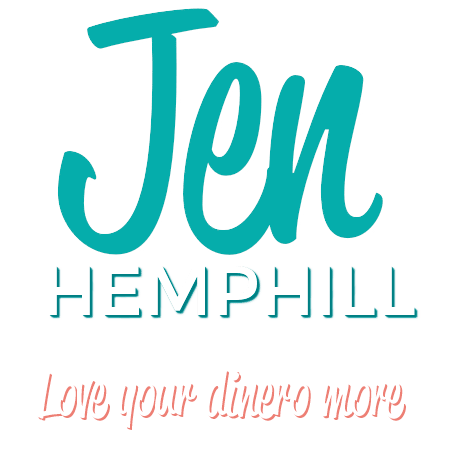 [00:00:28] JH: Hello there, this is Jen Hemphill. Welcome to yet another episode. 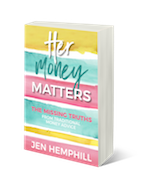 If it's your first time listening in to the Her Money Matters Podcast, I really, really appreciate you being here and thank you so much for tuning into the show. If you are a returning listener, as always, I am grateful to have you here. Today we are going to talk about one thing we aren't thinking enough when paying off debt. This episode has been really on my heart for a few weeks, so here I am. And the reason I'm doing this is because I've seen these types of headlines repeat themselves over and over again. You've seen them, where we see Suzy paying off $40,000 of debt in 10 months. Or Joe paying off $100,000 in debt in 28 months or 24 months, or whatever the case may be. The fact is, I have mixed feelings about these stories. So I'm gonna give you some insight into why this is all just my opinion, my thoughts, and what's in my heart. I wanna share it with you because I wanna give you a different perspective and just on a selfish note, I just wanna get this off my chest as it has really, really been bugging me. On today's episode I'm gonna share with you what you can gain from these debt payoff stories. I'm also gonna tell you what I feel is the danger of these debt payoff stories, and I'm going to reveal, for the first time, our own - my family's debt payoff headline, what it looks like, and I'm also gonna share with you my one disclaimer that you shouldn't ignore. Before I do that I wanna give a personal thank to Maggie Patterson. Maggie Patterson was a guest on Episode 11 and the reason I wanna thank is that she confirmed even more so that I needed to do this episode. It has already been on my heart, but she had asked a question in a Facebook group for business owners on a very similar topic, but more on the terms of entrepreneur "overnight success stories". So it's along the similar lines, and it created this beautiful really awesome discussion which let me know that I was not alone in what was on my heart, so thank you Maggie and thank you ladies that participated in that discussion that Maggie initiated for sharing your thoughts. Some of the ladies, I know I'm leaving some people, but I wanna thank you Erin, and Megan, and Amanda, and Angelica - or "An-helica", which I think it's pronounced - Jen, and the rest of the ladies who contributed in that discussion because it really definitely confirmed I wasn't alone and even put even more of a boost as to why I needed to do this episode. So let me share with you what's in my heart, because that's what today's episode is all about. As I mentioned, I've been seeing the same headlines over, and over again. I'm sure partly it's because I'm in the personal finance field, so that probably has something to do with it. Maybe you don't see them as much as I do, and maybe it can be something like when you buy a car, I know it has happened a lot. Where you buy a car you think you haven't seen that car a lot and all of a sudden it appears over and over again, right? So maybe it's something similar like that. Now I have to say, I love the inspiration behind them. I know they have good intentions. We've even had some guests on this podcast, like Jennifer Dent in Episode 7, Whitney Hansen in Episode 17, and Adrienne Dorison in Episode 19. And they all have these amazing, amazing stories of how they paid off their debt. And I'm definitely not taking anything away from their hard work. So if you take anything away, I wanna make sure that you know that. Really the mixed feelings or the problems I have with the stories that in my opinion these headlines, these stories can set the standard of what success is in terms of paying off debt. Then what can happen is that we can self-profess this expectation of how long it should take us, because we've seen in the headlines, cause that's what we should strive for, right? And then if it doesn't happen, we feel like failures. I mean take for example the images and the things that we see on television and in magazines of how women, the photos of women and how they look so perfect. When in real like the image of perfect is not that, what's on that cover of that magazine, right? So that's where my mixed feelings come in is that those types of things can happen. And let's talk about the other success stories, because think about it, paying off debt, no matter how much nor how long it takes is a success. So what about those stories? There's so many people, other people that have paid off debt. It might have not been in a short period of time, it might not have been the amount that is shown in the headlines, but they've paid off debt. So why don't we celebrate that? Why don't we share those stories? Why don't we recognize those people? I honestly believe that those stories are the majority of the population and we really need to hear more of those. Cause that gives other people hope. That gives other people a sense of, "I'm not alone". That gives people a sense of "I can definitely do this", right? It doesn't give them the image of, "Well I've got to do it this way or else I'm not as special." And I know I've said this before, personal finance is personal, it's unique, and everyone's situation is so different. So your debt pay off story is going to be different. So when you read those stories, read them for inspiration, read them for a connection for something that is similar in your life that really, really resonates with you. Read them for the tips that they provide that you love, that you wanna go and apply and put them in action right away. But just remember, and I urge you, really urge you to remember that your journey is unique. It's not going to be the same as theirs. So if you get the debt paid off as fast as they did, that's awesome. But if you don't, don't forget what you've accomplished already by paying the debt that you have already to this point. Celebrate that. Why not, right? And again, I know I'm stressing this, but I don't want you to forget. That's why I'm repeating it over, and over again. Remember your journey is different. We know but we, even though we know, we tend to forget cause we take it for granted is that everyone's expense needs are different, the debt amount is different, your bottom line in other words the amount of money that is left over after everything's taken care of is different. Maybe your health needs are different. Maybe you have extra health bills other people don't have. Maybe you have a special needs kids or spouse or an aging parent that you're taking care of. Maybe the income is not a stable income every single month. There's so many factors, I literally can't list them all cause there's just so many. So really I just want you to remember that, just don't let the definition of success, like these headlines and these stories show, be defined for you. Do we have a deal? And can we shake on that? As you can tell, I'm really, really pumped up about it and this is really, really big on my heart. So now let me tell you, or spill the beans about our debt payoff story. So we became debt free in early 2015. So at the time of this recording it's late 2015. So no too long ago. And you ready? I'm gonna give you what would be the headline if it became a headline in some article. It would be something like, "Married Couple has $45,000 in Student Loans, and Pays it Off in 15 Years". Silence in the room, right? Yes, it took us 15 years to pay $45,000. Other people have paid $45,000 in a shorter period of time. That's definitely very different, right? But here's what the story, or the headline left out if you're disappointed. So hopefully you weren't, but if you're disappointed, this is what it left out: it left out that in 15 years we also lived on one income for most of the time. It also left out that we had two children. And for those of you parents, you know children. When you have children you have more expenses. It also left out that we made some big purchases, we took some trips that we paid in cash. We didn't create any more debt. We really prevented more debt if you wanna look at it that way. And over those 15 years we also paid off another maybe $72-$80,000 in debt, okay? So that included cars that we needed to replace, things of that sort. Maybe some big purchases, some things that we had to get a loan for, those type of things. So in over 15 years we paid that amount as well. So I guess the headline could've read, "Married Couple Pays off $125,000 in Debt in 15 Years". Maybe it's still not impressive for the media, maybe it wouldn't even make the headlines, right? But somewhere in the States, if you think about it, you can buy a house for that price and a fairly good house. So that is, if you look at it in other terms, that in essence, that's paying a mortgage in 15 years versus 30 cause typical mortgages are in 30. And I share that with you so you can see that my debt story is different from the common headlines, from the common debt payoff stories that we see. But it is our debt story, and none the less, the debt is gone. So could we have done it quicker? Yeah. But we had to make some decisions in those 15 years at different times that affected how we paid off this debt. So we made some decisions that at that time we deemed were the correct decisions, right? And so therefore it delayed us in paying the debt off quicker. Now, this is my disclaimer right here; I'm not encouraging you by any means to delay your payoff of your debt, okay? The quicker you get it done, that is the better. So you know in your heart if you're making some extra payments and one month you don't feel like it cause you wanna go shopping for whatever reason and buy some things that you like, you know in your heart if you're making an excuse and you're thinking, "Well Jen said this in this podcast." I'm making the disclaimer, this is not in any way or form encouraging you to delay when you pay off your debt. You know in your heart if you're making an excuse, or if it's a good decision. I just don't want you to compare yourself to the headlines, that is all. That is the whole mission in this whole episode. So today we talked about what you can gain from these debt stories - debt payoff stories. We talked about the inspiration, the connection you can gain, the tips that you can gain from the stories. 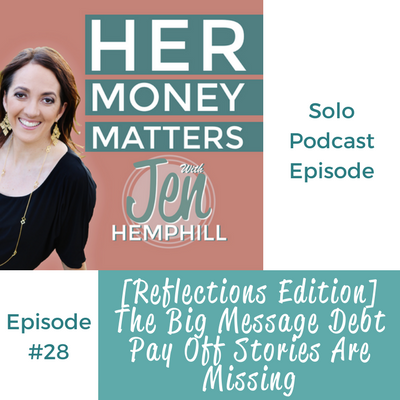 We also talked about the danger that these debt payoff stories have and that's giving you a different sense of what success is, and you don't want that. And also we talked about the successes that we're not really talking about, those people that pay off debt because that is a success in itself, and why aren't we recognizing that, right? I also revealed what our debt headline looked like, and probably the media won't pick it up for a headline anytime soon, but it's our debt payoff story and guess what? We're out of debt. We're proud of it, and that's what we need to celebrate, all of us. And I also talked about my one disclaimer that you shouldn't ignore, and that was to make sure that because I'm sharing this with you, that you don't make excuses to take longer in paying off debt. You know what's in your heart, you know if it's an excuse what your hearts telling you if it's an excuse or if it's a good decision that you need to make. And that is it. So I hope you got some value of that. I feel so much better getting this off my chest and sharing this with you. But I wanna hear from you. How about you? What do you think of these headlines and these stories? Do they inspire you? Do they alienate you? Or do you have mixed feelings like I have? So just make sure you share that with me, go to the show notes, today's show notes and leave me a comment in there. Now lastly I wanna make sure that if you haven't joined our free community on Facebook, that you do. So if you're wanting to surround yourself with like-minded women who want to be more confident and take charge of their finances, I have created a community for you and we're having a lot of fun. You can find it and join it at JenHemphill.com/community. So that's JenHemphill.com/community. We're currently, at the time of this recording, we are running a contest with some fun prizes, so just be sure to join us in the fun. So that is a wrap for today. Thank you so much for taking time out of your busy schedule to tune into this show. You can check out the show notes for the links that I mentioned, the episodes that we talked about, the transcript and more at JenHemphill.com/28 as in Episode 28, that is JenHemphill.com/28. So you can refer back to the show notes at any time that you want. So thank you so much for listening and we will talk again next week on Thursday.